With the incredible advances in digital photography over the last decade, it’s become a cliché that everyone is now a pro photographer. Simply attending the annual Pro Photographer’s Showdown, or browsing the catalogue of one of Whistler’s many true professional photographers, however, will quickly dispel such notions. Still, technology has levelled the playing field to a certain extent, making it quite simple to take competent, even beautiful images with minimal training. Go back eighty or nintety years and this was most certainly not the case. Cameras were heavy, expensive, cumbersome, and complicated, not to mention the challenges of processing film (remember that stuff?) in the 1920s. Take the couple of thousand photos we have in the Philip collection. Judging by the sheer quantity of images, it can be safe to assume that Myrtle Philip was a fairly competent amateur photographer for her time. Still, a solid majority of the images are imperfectly focused, overexposed, or awkwardly composed. As documentary artifacts they are wonderful, but for the most part they are lacking in artfulness. Scanning through the Philip archives, however, the occasional gem stands out. Crisp images, deliberate composition, some have even been hand-painted to add the magic of colour. These are undeniably the work of a professional. These images are not the culmination of years of devotion to the photographic arts by Myrtle. Instead they were gifts and mementos from a friend and frequent Rainbow Lodge guest, Leonard Frank. 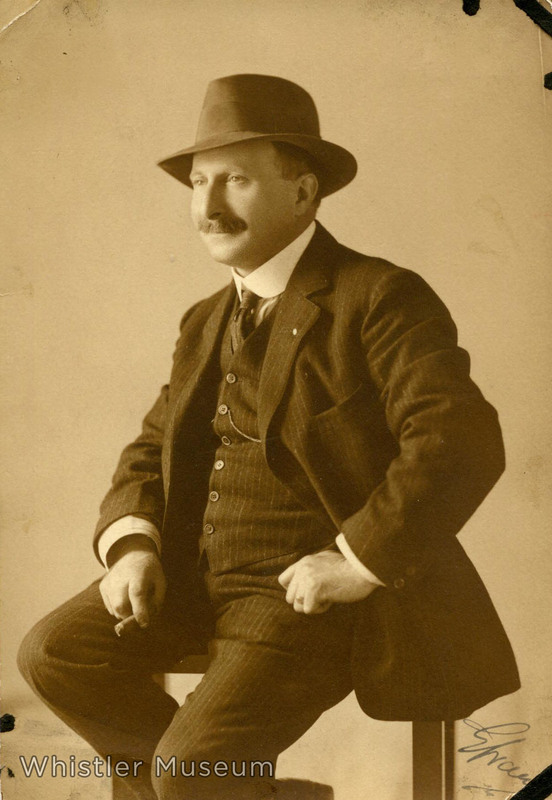 Son of one of Germany’s earliest professional photographers, Leonard Frank was born in Berne, Germany in 1870. 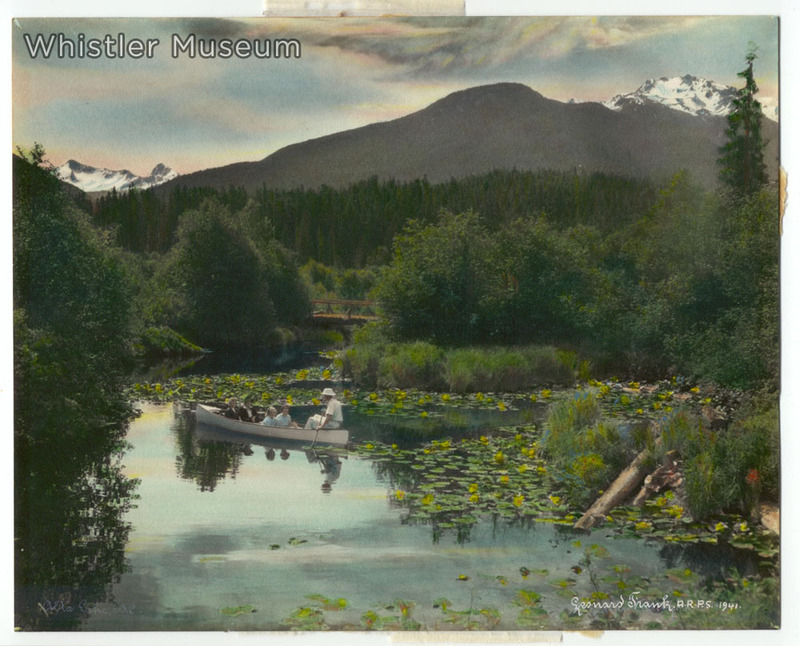 Gold fever drew Frank to San Francisco in 1892, then Vancouver Island two years later. Like so many would-be gold barons, his dreams of mineral riches never panned out. As fate would have it though, he won a camera in a raffle, sparking a lifelong passion. While managing a general store and continuing to prospect, Frank honed his craft taking pictures of the surrounding countryside. Eventually, in 1917, Frank moved to Vancouver and quickly became the city’s leading commercial photographer, following in his father’s professional footsteps. From then until his death in 1944, Frank ‘s diverse photographic catalogue is a crucial document of Vancouver and British Columbia’s history. Beyond his personal and commercial work, he was frequently commissioned to photograph for both the provincial and federal governments, as well as being the official photographer for the Vancouver Board of Trade. 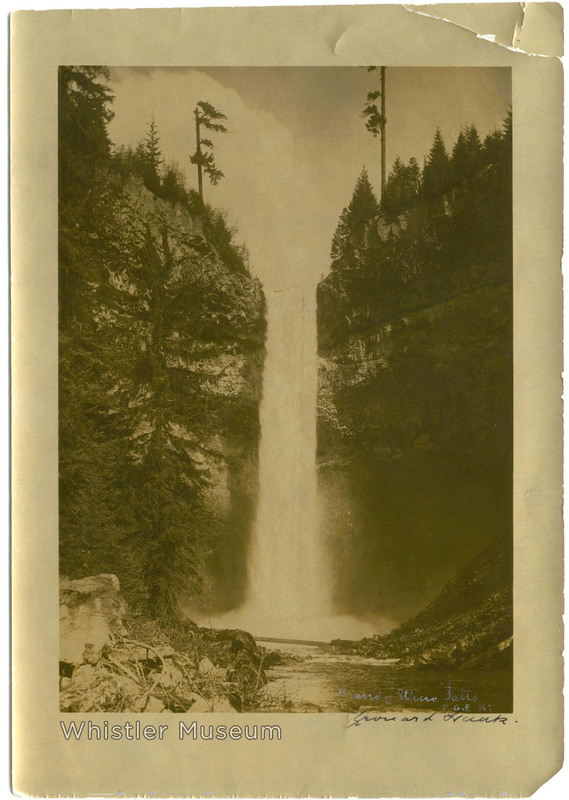 Brandywine Falls from a now inaccessible vantage point, circa 1920s. A boater’s view of Rainbow Lodge and Rainbow Mountain. 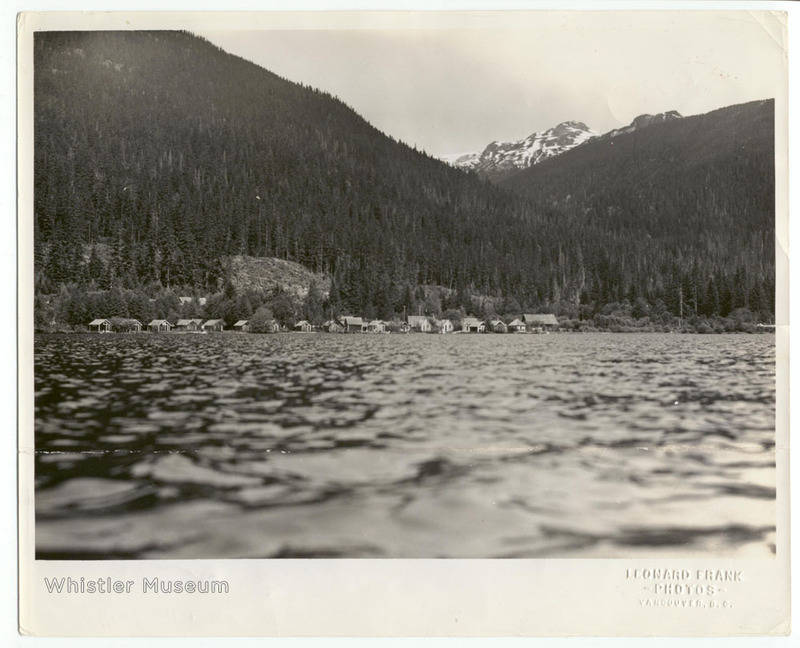 Frank’s Alta Lake images in our collection span from the 1920s until the 1940s, indicating multiple trips to the valley. For the most part it is unclear whether the images were commissioned by the Philips to promote Rainbow Lodge, were commissioned by other parties, or were taken on his own volition. 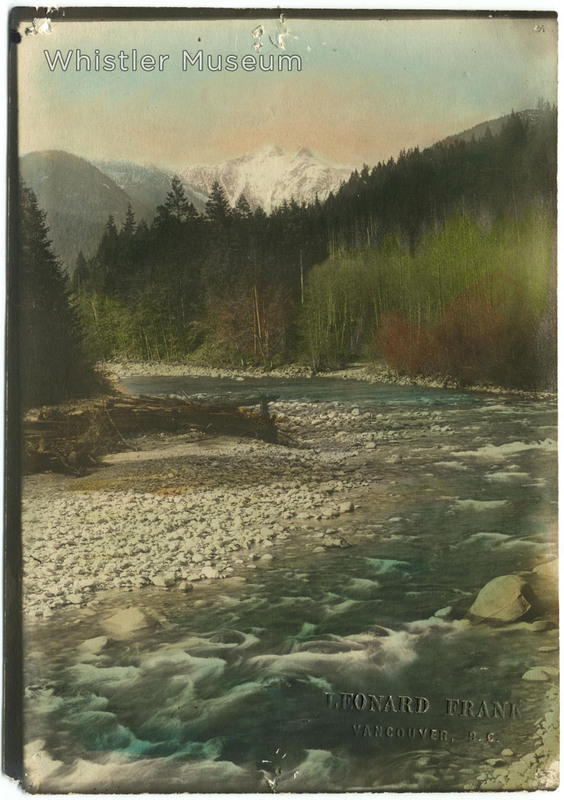 The following image, surely one of the most beautiful in our entire collection, is accompanied by a typed note “Presented to Mr. and Mrs. Alex Philip, with my compliments, Leonard Frank, A.R.P.S.” ARPS is short for “Associate of the Royal Photographic Society.” Frank was the first British Columbian bestowed with this honour. Alex Philip takes some Rainbow Lodge guests for a paddle down the River of Golden Dreams, 1941. From today’s perspective, where visual media is such a crucial tourism-promotion tool, these photographs are of heightened historical interest. Leonard Frank was the first professional photographer in a town that has become known for its abundance of pro photographers. By any standard, Frank’s images expertly portray an idyllic destination amidst a grand, inspiring landscape. In his own way, he contributed to the Whistler Valley’s development as a nature-tourism destination, and led the way for dozens of others who have made a living capturing our valley’s natural charms. For more information about Leonard Frank, and examples of his images, check the Vancouver Public Library‘s extensive Leonard Frank Collection, this short blog post by Miss 604, or try to track down a copy of the 1990 book An Enterprising Life : Leonard Frank Photographs, 1895-1944 by Cyril E. Leonoff. This entry was posted in Environment, From the Archives, Pioneers. Bookmark the permalink.